Novotel Ambassador Seoul Yongsan features an Executive Floor Lounge on level 40 with views of Seoul, direct access to a unique structure suspended between two towers filled with entertainment outlets and the most extensive meeting space capacity among hotels in Korea. You will also be able to enjoy the wonderful facilities such as fitness centre and indoor swimming pool during your stay here. Located at the heart of Seoul, Novotel Ambassador Seoul Yongsan is next to the Electronics Market and Yongsan Station, and only 10min away from Yeouido Financial District and Itaewon. Seoul, a fascinating city which offers a unique blend of the ultra-modern along with a wealth of ancient palaces and gardens. 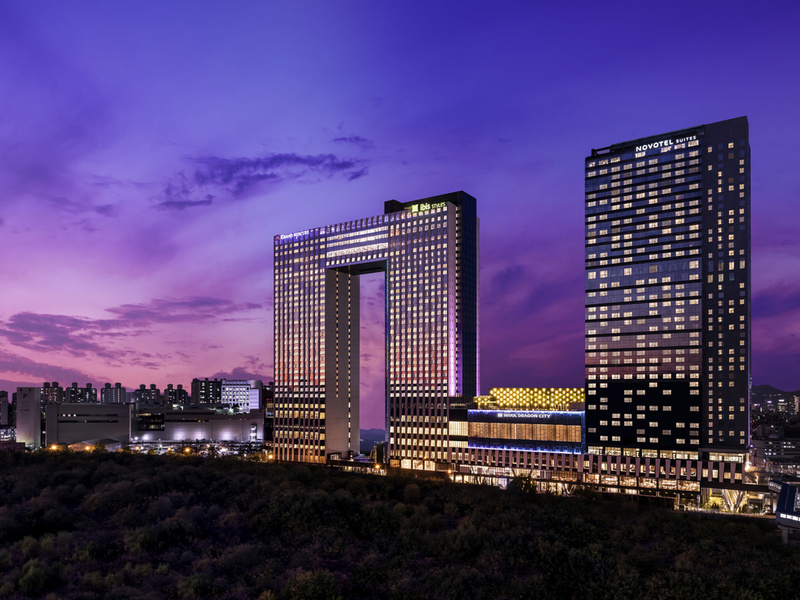 Featuring the impressive Namdaemun City Gate, and adjacent to the bustling Itaewon shopping and entertainment district. Seoul is one of the most vibrant business capitals in Asia. The name of Yongsan District means "Dragon Hill". It is at the centre of Seoul, next to one of the most interconnected railway and subway stations in the country. Located at the heart of Seoul, Novotel is next to the Electronics Market and Yongsan Station, and only 10min away from Yeouido Financial District and Itaewon. It offers rooms that are larger than typical Novotel rooms, with views of the Han River. Our superior room mixes modern decor, ergonomic comfort and high end facilities: Work area, LED TV, minibar, free Internet, access to fitness center and pool. Up to 2 adults and 2 children. Food Exchange is a premium all-day buffet restaurant inspired by lively food markets found around the world. The spacious dining center presents a wide variety of gourmet dishes inspired by local cultures and recipes. Brasserie <THE 26> features a variety of food menus & cocktails. You can also enjoy a panoramic city view during the day and glittering night view in the evening. Mega Bites is a 'lobby casual bistro' in a relaxed atmosphere. Rooms are clean, well equipped with all the amenities that you need. Bed is very comfortable and linens are clean. The only thing was it takes a bit of walk to cross over the bridge to Yongsan station. Staffs are courteous and well mannered. The staffs were very friendly and very willing to help with anything! Room was cutely designed and very clean. Awesome priced takeout coffee and enjoyed it everyday. I wished I had a time to use the gym, but it was probably as nice. Great stay for the great price! I stayed at the Novotel Ambasador Seoul Yongsan and had a nice relaxing stay. The rooms are clean and modern. The check-in process was great and thank you to Stacey Kim for helping out, you were great. The hotel is a easy 7 minute walk to Yongsan station and to the iPark Mall. If you need to get to USAG Yongsan, it is a simple drive to any of the gates. The Staffs, from the doorman, the receptionists all the team has great energy, friendly, and ready to help. Please, the rooms cleaners are not forgotten!!! The rooms are clean. I hope to back again. The hotel room was clean & tidy. Enough space, mattress was good except the shower room layout can be better. I would prefer to have a shower curtain otherwise water splash around during showering was quite annoying. The staffs are all very kind, highly appreciated their support for helping arrange for airport transfer. The food quality at breakfast place was good too, the foods are delicious. Designed to happen bottleneck phenomena. Almost one thousand hotel rooms but small size of front desk area, small size of lobby lounge area, only one small lobby lounge cafe, small size of swimming pool and only one breakfast buffet restaurant, and only 5 elevators means you may encounter any inconvenience and long line of waiting when you check in and when you enter the restaurant to eat breakfast and so on. Breakfast charge is about 33 dollars per person (Korean won 36.000 or so) for the person who stay at the hotel. Breakfast menu and quality is not bad but are not deserved to be paid such a high charge and sometimes you might wait for long time before you enter the restaurant. So, I don't recommend you pay for such a high price for a just breakfast. The room is clean but room is very small and the twin beds are small also considering this hotel is 5 star hotel and require a rather high price. If you can reserve another 5 star hotel room in Seoul area with similar price (more than or around 100 dollars without breakfast) , I would recommend you choose that one not the Novotel Yongsan. Needed to pay for necessary stuff like toothpastes.. No room make-up service at 8pm.. Restaurant waitresses and girls at the check-in counter could not communicate in simple English. Location was far away from major tourist attractions. Room is nice & newly renovated. Room rates are affordable. Restaurant offers generous range of food at the restaurant. It will be great to have complimentary drinking water in all rooms. I stayed 2 nights Executive twin room. This hotel was newly opened last year so every facility and room condition are fine. #2353 has a bathtub but it is not convenient to use. We had to mop up after taking a bath. However I’d like to give compliments to all staff. Especially at the concierge staff. I felt super kind. This is I’ve never experienced kindness when I stayed any other 5-stars hotels. I really appreciate. Nice hotel and great service. Great service, nice room and space. Good room and service overall . Very expensive to eat at this hotel. Modern room design and very functional. Love it. Executive lounge was spacious and hot food served during happy hours was of very good standard. One downside was that as a AccorPlus platinum member, only the member gets to enjoy the lounge. It was kind of Maxime to allow lounge access for my guests using the second room booked under my name. The truth is that I would not have booked this hotel if I knew the my guests were not allowed executive lounge access. It was a standard I had come to expect of Accor. Free upgrade. Pleasant staff. Excellent support. Keep up the good work! We were able to get connecting rooms and relax and see Seoul before leaving. Close to major train line. The room was a modern design and enjoyable rest. Rooms and facilities are very nice. Staff are pleasant and helpful. No need to change my soap and amenities everyday as it is a waste.